SEPANGAR, Malaysia - The submarine tender USS Frank Cable (AS 40) departed from Sepangar April 17 after a port visit focused on strenghtening ties with the Royal Malaysian Navy (RMN) through subject matter expert exchanges. 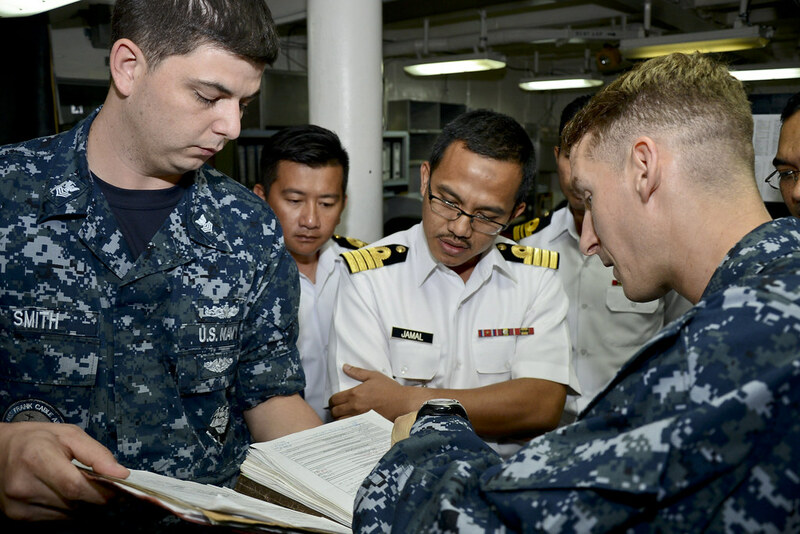 "During our visit, we engaged heavily with the Royal Malaysian Navy (RMN) submarine force, where we provided training to the RMN in the areas of controlled work practices and the Quality Assurance program," said Capt. Mark Benjamin, commanding officer of Frank Cable. "Through office calls and staff talks, we also promoted combined U.S. Navy/RMN submarine operations and exercises and made plans for future military-to-military engagement. Each of these venues offered a unique opportunity to foster our growing relationship with our friends in the RMN by sharing best practices, common concerns, and sea stories." Frank Cable crew members provided familiarization tours of the ship to over 100 RMN officers and enlisted sailors and sea cadets, participated in a team building sporting event with the RMN, hosted a reception onboard the ship for 220 U.S. Navy/RMN members and attended officer and enlisted receptions hosted by their RMN counterparts on base. "I had a great discussion with my counterpart (RMN weapons officer)," said Lt. Eugene Mendez, Frank Cable's weapons officer. "We discussed services we provide to the fleet and how fast paced it gets. We also discussed capabilities and future opportunities that could strengthen relations between our two navies. These socials provide a great opportunity to build relationships and trust that will pay dividends in the future." RMN is one component of Malaysia's armed forces, which includes the Royal Malaysian Air Force and Malaysian Army. "It is vital to maintain constant interaction with the RMN to ensure our readiness throughout the area of responsibility," said Mendez. During the port visit, Frank Cable Sailors teamed up with Sailors from the Los Angeles class fast-attack submarine USS La Jolla (SSN 701) to deliver Project Handclasp supplies and participated in community service events with Likas Hospital, Bukit Harapan Children's Home and the Single Mother's Association of Karambunai. Malaysia is a nation of approximately 30 million people located in southeastern Asia and has had diplomatic ties with the U.S. since the nation was established in 1957. "This growing relationship between our two submarine forces helps to promote stability and security in the Indo-Asia-Pacific region by showing a strong commitment to regional partners," said Benjamin. Frank Cable, forward deployed to the island of Guam, conducts maintenance and support of submarines and surface vessels deployed to the U.S. 7th Fleet area of responsibility and is currently on a scheduled underway period.